There are Kitchen Cabinets designed for every budget, taste and lifestyle. Whether you are an architect, builder, remodeler, designer, do-it-your-selfer, a first time home buyer, or are planning your own dream kitchen, there are kitchen cabinets that are perfect for you. Kitchen cabinets can make a statement, cabinetry can act as beautiful built-in furniture, kitchen cabinetry can be used to create the perfect home office. Cabinets can be used in the mud room, the laundry room and even in a bedroom as tasteful built–in storage. With the ever-expanding options available in kitchen cabinets and cabinet accessories, you can design a kitchen or living space that functions exactly the way you want, making it not only beautiful, but highly livable as well. Knowing your options and flexibility within a cabinet line will make designing your space easier and you’ll end up with a room that was worth the time and investment for years to come. STOCK: Stock kitchen cabinets are exactly what their name implies. They are pre-manufactured cabinets that you can buy “off the shelf” or order from a catalog. Generally, these kitchen cabinets are at the lower to medium quality range and can be bought through big box home improvement stores, lumberyards and kitchen companies that sell cabinetry. Stock kitchen cabinets that can be ordered may offer more flexibility in door styles and finishes. Those styles and finishes along with modifications to size, construction or choices of interior accessories can be limited in stock kitchen cabinets. But, if your project requires you to be very budget conscience or you need to get the project done quickly, stock kitchen cabinets may be exactly what you’re looking for. SEMI-CUSTOM: The term “semi custom” kitchen cabinets covers a large scope of cabinet lines. Some of the less expensive semi-custom kitchen cabinets lines will offer some “changeability” but will limit you to what these changes might be. Some semi custom cabinet lines use outside vendors to supply their doors and drawer fronts, therefore, the width and height of the cabinet may be unchangeable. But, you may be able to change the depth, add interior accessories or extend the rails and stiles. The more you can modify on the cabinetry, the more likely the price will go up. Modifications usually have fees attached to them, so, the more you change a cabinet the more expensive it can become. Semi-custom cabinet boxes will usually be built using higher quality materials, they’ll utilize upgraded hardware and fasteners, and offer more finishes and styles than stock kitchen cabinets. All these things put semi custom kitchen cabinets somewhere in the middle when it comes to price, quality, finishes, availability and customization. 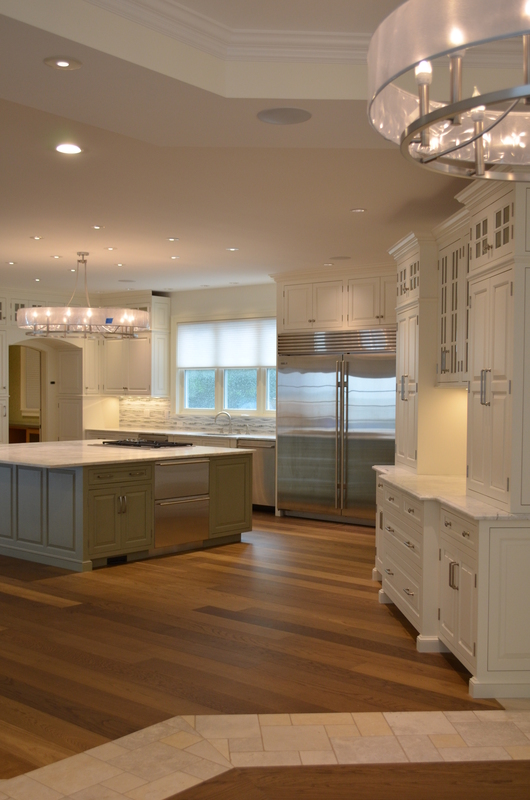 CUSTOM: Custom kitchen cabinets are typically at the “higher end” of the price range for kitchen cabinetry. 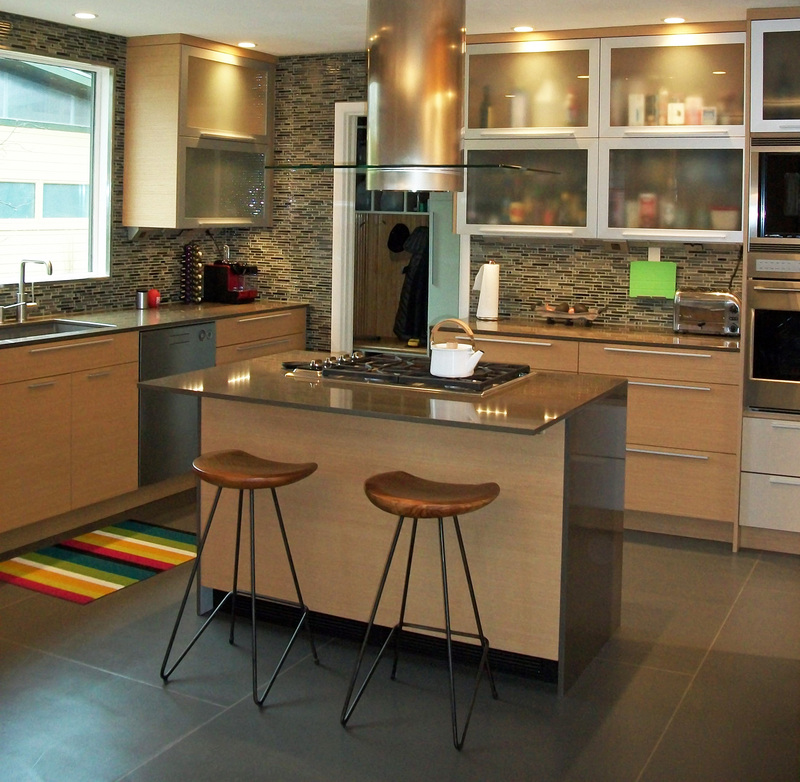 Custom kitchen cabinets offer a more extensive choice of modifications and accessories. This allows for more design options and configurations. You can design a certain part of your kitchen so it works perfectly for your lifestyle or so it will fit within a unique or difficult space. Custom kitchen cabinets also have greater choices of construction materials, door styles and finishes. The door overlay options will also vary. Flush inset, beaded inset or European full overlay on a frameless box are some of the construction options you’ll have when purchasing custom kitchen cabinets. The number and variations of finishes will be greater, and if you want to custom match your cabinet’s finish, most custom kitchen cabinet companies offer that service. Custom kitchen cabinet manufacturers offer artistic finishes as well, techniques like glazing, hand rubbed finishes, crackled finishes, worm holes and rub through (where you can see another color or natural wood through some areas) are just some. You can even get custom cabinets in exotic veneers or lacquered finishes. The box construction of a custom kitchen cabinet is built more like a fine piece of furniture. Great care is taken in the choice of materials used to construct them, the hardware and fasteners that are used and what the finishing process is. With all the available choices, the flexibility in design and function and the top quality materials and craftsmanship that go into custom kitchen cabinets, you’re sure to find the perfect kitchen cabinets for your project.